(16/P87) TRENTON – The Department of Environmental Protection’s artificial reef program is sinking two more vessels to enhance recreational fishing opportunities and enhance ocean habitat for fish. 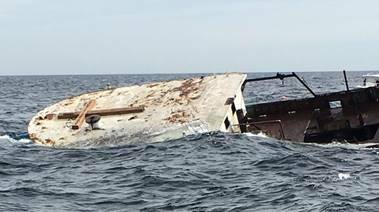 The program, back in gear following restoration of federal funding, sank the 68-foot trawler, Austin, today as part of the Axel Carlson Reef, 4.4 nautical miles southeast of Manasquan Inlet. 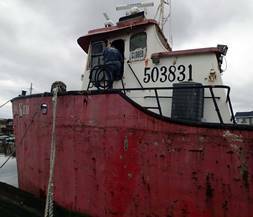 The 115-foot surf clam vessel, Lisa Kim, is scheduled to be sunk as part of the Wildwood Reef, 8.3 miles northeast of Cape May Inlet this Friday, weather permitting. The boats are among as many as 10 vessels the DEP’s Division of Fish and Wildlife plans to deploy by the end of fall. After a hiatus of nearly five years, three vessels were deployed over the summer. The sinking of these vessels was made possible by an agreement reached by the Christie Administration regarding access to reefs by recreational and commercial fishing interests that resulted in restored federal funding for the artificial reef program. artificial reef structure materials attract the most fish. Among the vessels expected to be deployed before the end of the year is the former U.S. Coast Guard Cutter Tamaroa immortalized in the book The Perfect Storm and the movie by the same name for its rescue role during a brutal nor’easter in 1991. Originally a U.S. Navy fleet tug, the Tamaroa is also the last surviving vessel from the World War II Battle of Iwo Jima. Old vessels and other materials used in artificial reefs provide surfaces for organisms such as algae, barnacles, mussels, sea stars, and sea fans to grow on. This colonization occurs in as little as two weeks. These organisms attract smaller fish which, in turn, attract black sea bass, tautog, summer flounder, scup, lobster and other sought-after species.